I often make my own pasta sauce using tomatoes from our garden but I also like to use Enrico's Fat Free Pasta Sauce. Unfortunately, it almost never goes on sale, but Publix sells it at the lowest price- $3.49 for 26oz. It contains NO OIL, and NO SODIUM! The two things in all commercial pasta sauces that make them unhealthy! The rule on sodium content is that your sodium milligrams should be equal to or less than the calories in one serving. For most pasta sauces the calories are 60 and the sodium content is 600 milligrams! Now, it takes adjusting to if you are used to high sodium foods, so you may want to lightly sprinkle salt on top of your finished pasta dish. Gradually eliminate that habit and you will find that this sauce is perfect. Whole Foods has finally taken a stand on defining what Whole Food nutrition should be. 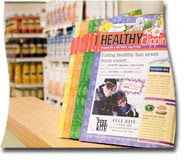 They have adopted Dr. Fuhrman's Eat for Health plan and the Engine 2 Diet! Two of the best plans for Nutrient Dense Vegan diets. -Using Dr. Fuhrman's ANDI scores in the produce section of the stores so that people can see what foods have the highest nutrient levels. For more information go to the Whole Foods website. Even if you don't use a lot of Agave Nectar, why would you pay full price at Whole Foods or Publix when you can get it for 80% less! 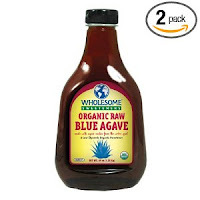 The price is $16.21 for Wholesome Sweeteners Organic Raw Blue Agave, 44 Ounce Bottle (Pack of 2) and you can sign up for Amazon Subscriptions to get an additional 15% off plus FREE Shipping! The price comes out to $13 and change and the Agave arrives within days to your home. Harvey's $2 off $5 produce coupon to get the Organic Salad Blend for $1.50/bag. You will need to sign up for a Harvey's Reward Key to get these coupons. I wrote Eden Organic and got a stack of .55/1 coupons, so I will use two of those to get the EdenSoy for $1.50 Tetra Pack. EdenSoy is different from other Soy Milks. The product contains only Soybeans and purified water. There's no other additives similar to what is found in other commercially made soy milks. Get Kashi for .50 a box with 1 Manufacturer's Peel off coupon (on the boxes), 1 Whole Foods Whole Deal Coupon (you will need to pick these up at your local Whole Foods). If you are just starting out couponing, you may only be able to get a few of these deals. Keep collecting coupons! The items will go on sale again and then you can take the opportunity to stock up a bit so that you have enough until the next sales cycle. Check out my blog post on totalwellnessmentor.com. I checked iheartpublix.com and here's what I found on sale this week at Publix that would work with the Eat for Health plan. There's not much you can stock up on except the EdenSoy and Kashi 7 Whole Grain Cereals. These include coupon matchups. The rest is produce of course! I took a couponing class from a friend back in April after a group of my health conscious friends had taken the same class and raved about how much money they were saving. I viewed many store receipts from those friends and wondered how on earth they were able to save so much....with coupons?! Well, I've learned a lot in the past few months...that's one of the resons I've been absent! I've been busy coupon collecting from every website I can find that offers Organic products. Some of the things I can think of off hand that I have saved 80%+ on are Organic Frozen Cascadian Farms Fruit and Vegetables, Seventh Generation Products, Jason Organics Products, Kiss My Face Products, Almond Breeze, Blue Diamond Almonds, and Silk Organic Soymilk! I have also found coupons for Eden Organics products, San-J Organic Tamari, Honest Kids Juice, Earth Friendly Cleaning Products, Rice Select, Publix Produce, and Restaurant coupons! I was a big Whole Foods shopper, now I am at Publix every week and only once a month at Whole Foods, Chamberlin's Market or Hoover's Essential Health Market to pick up things I cannot find at Publix and catch any monthly sales...with coupons!! You can get the best deals at Publix because they have the BOGO deals and you can use both a competitor store coupon and a manufacturer's coupon on BOTH the item you buy and the free item! My favorite blog to follow for the latest deals at Publix is iheartpublix.com. The blog owner will post the Publix sales flyer three days prior to the sale with coupon "matchups" (she tells you exactly where to find the coupons to get the deals). 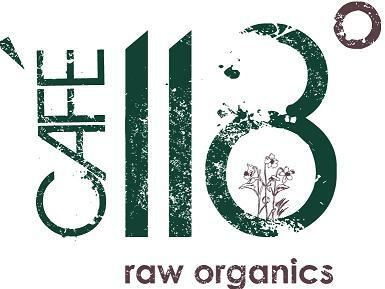 My favorite blog to follow for Organic Deals is Organic Deals and Coupons. And lastly, if you'd like to take couponing classes in Central Florida you can join Couponing with Regina on Facebook. If you are outside the Central Florida area you can take classes online at Becentsable.com. You have been enlightened! Now please do not ignore this post...go SAVE some money!! !